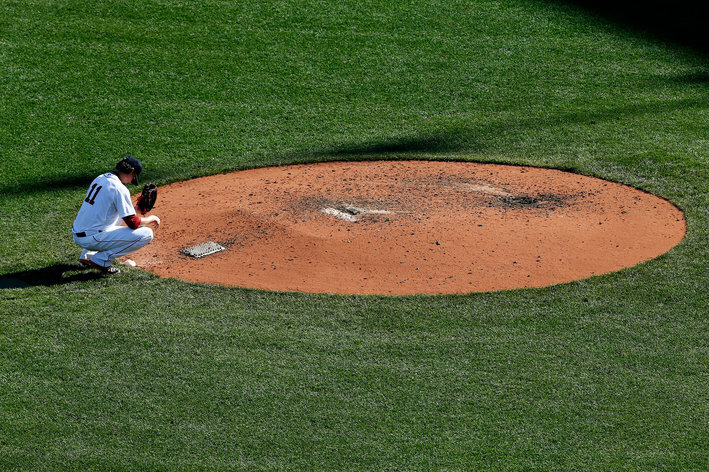 The 2014 season seemed promising for the defending World Series champion Red Sox. They returned almost all of their starting rotation. The missing member of the 6 primary starters from the previous season was its weakest link: Dempster. The bullpen was largely intact as well. The pitching seemed to be ready to go. The one mystery was how Buchholz would bounce back from the injuries that hampered him for the 2nd half of the season. They had a number of new players in key positions. Two were highly touted rookies Xander Bogaerts and Jackie Bradley Jr. Ellsbury would be missed in terms of offense but they hoped to make that up with Xander’s estimated production to be far greater the Stephen Drew’s. I was not wild about the signing of Pierzynski but his offense was expected to compensate to the loss of Saltalamacchia (he was go from .273 to a paltry .220 with the Marlins). The hope was for Middlebrooks to bounce back. The plan was slightly altered when Grady Sizemore had an awesome camp and make the opening day roster. Looked great but then he failed to produce at the same pace. Or nearly any pace. But I get slightly ahead of myself. All the breaks that went their way in 2013 didn’t in 2014. The new replay system seemed stacked against them in the first month as everyone tried to adjust. Lots of blown calls seemed to go against them. Some of these were game changers, or so it seemed. Another thing that went right in 2013 is that a high number of players who played above their means. They had above average seasons, often career years. Saltalamacchia, Nava, Carp had career best seasons. Papi hit exceedingly well for his age. He hit for average and power. Napoli bounced back to have a good offensive season as did Victorino. Part of what went wrong was regression to mean for the players still on the roster, and not on the injured list. The main problems initially were a lack of production from the outfield. Nava was pressing and in a big slump to start the season. Victorino was hurt and the combination of Sizemore and Bradley hit about .220. Middlebrooks continued to struggle. The offense was stagnant. Even Pedroia and Papi got off to a slow start. Seemed like the only guys who didn’t were Napoli and Xander. Buccholz was just plain horrible. New reliever Mujica was too, and blew some games early. Peavy just couldn’t buy a break. And then the real problems started. Napoli injured a finger and was never the same. Middlebrooks got hurt, again. This “forced” them to re-sign Drew and shift Xander to 3rd. For the first time in his career, shortly after the switch, Xander entered a big, ugly slump. Unknown to the rest of the world, Pedroia was still hurt and not productive at the plate though he still played stellar defense. But he was the only one. Okay, Bradley was playing fantastic defense. Xander struggled at third, and they couldn’t throw a base runner out. The changes started to come fast and furious. They gave up on Sizemore and cut him (he was hitting .216 at the time and hit a slightly more respectable .243 for the Phillies). Pierzynki was cut (he hit .254 for the Sox and would go on to the Cards and hit .244 for them on the way to the playoffs). Peavy (1-9, 4.72) was traded to San Francisco where he was 6-4 with a 2.17 ERA helping the Giants make the playoffs. Amid tons of chatter about signing an extension, Lester was traded to the A’s who he helped make the playoffs. Lackey was sent to St. Louis whom he helped make the playoffs. Noticing a theme here? Let’s not forget trading Miller to division champion Baltimore. One plus was that Christian Vasquez had the opportunity to show he can handle a staff and throw out runners. His production was not great, but he stopped the other teams that ran at will on Boston early in the season. Those runs saved amount to something important. If you are looking for the definitive description of how Pentecostals view and approach sanctification you may want to keep looking. Or maybe this is right on the mark. I hope not. Russell Spittler’s chapter in Christian Spirituality is largely descriptive, not prescriptive. By this I mean he describes a number of common Pentecostal practices that are viewed as manifestations of the Spirit which have no apparent connection to sanctification (as far as I can tell). He doesn’t mention how they further the sanctification process. I have had Pentecostals tell me that speaking in tongues helps them avoid sin, but never how. He begins by noting historical developments and their roots in a second blessing theology similar to Methodism. Instead of entire sanctification this is viewed as baptism in the Spirit. It is rooted, again, in a two-stage understanding of Christian experience. This takes the progress of redemptive-history as normative for us. Not in the sense that we should receive the baptism in the Spirit, but that it lags after justification/conversion and is necessarily accompanied by speaking in tongues. He provides very little theological justification for this view or the various manifestations he will describe beyond a few proof-texts. There is no attempt at any systematic understanding of anything. The 3rd view of sanctification presented in Christian Spirituality is a Wesleyan view by Laurence Wood. There are aspects of the Wesleyan view that he clarifies so common misunderstandings no longer remain misunderstanding. The main positive I found was that of expectation- the expectation that God will work in you to sanctify you. Forde, in his Lutheran response did not share my view of this as positive. He begins by talking about the Wesleyan hermeneutic. It is very good that he does this because it reveals some of his presuppositions for us to examine as well. Too often the method of interpretation used to arrive at a conclusion is not mentioned. So he unpacks, briefly, the “personal-relational dimension” of the way Wesleyans tend to “do theology.” Certainly our personal and corporate histories shape our understanding of Scripture. Sometimes for good, and sometimes not so good. His main point is that “the crucible of life is the laboratory for testing our interpretation of Scripture.” The key phrase is “our interpretation.” They are not testing the Scripture, but their interpretation. Our theology should work: making sense of life, our experience and shaping our life in positive ways. The gospel produces good things in our lives, though often thru difficult experiences. Many people stumble over the phrase Christian Perfectionism. Wesley was not speaking about absolute perfection. Entire sanctification, another confusing term for non-Wesleyans, refers to a “second blessing” (yet another confusing term for non-Wesleyans and non-Pentacostals) or subsequent blessing that gives us perfect love for God. This perfect love for God results in “perfect obedience.” This does not mean we are sinless, but that we no longer willfully sin. There may be unintentional sins, and there are “psychologically repressed complexes” that result in disordered behavior. But our intentions are good and pure even if our behavior is not (I wonder how much Neil T. Anderson’s material connects with the Wesleyan view).